Jeea is a UK-based British Pakistani artist who is inspired by the arts and crafts of both Islamic and medieval traditions. She began her journey with the simple desire to re-create beautiful patterns, which soon developed into a contemplation of the hidden meanings that lay under the surface of her designs. Each layer of line and structure, a veil which can be lifted to reveal hidden truths. 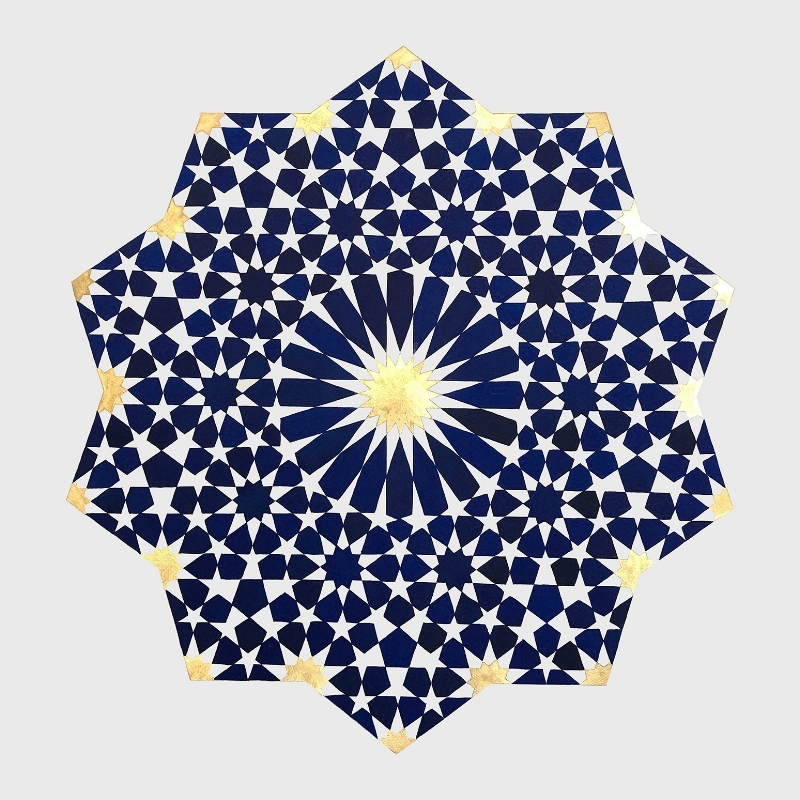 Jeea has studied Islamic geometry and Islimi extensively with the Art of Islamic Pattern Institute in various locations including London, Granada, Istanbul and Fez. She also holds an Open Programme Diploma from The Prince’s Foundation: School of Traditional Arts. Her study of sacred geometry and arabesque is an ongoing journey of discovery which continues to inspire her with its timeless beauty, simplicity and paradoxically its complexity. Ultramarine was the name given by medieval European artists to the beautiful blue pigment made from lapis lazuli. Literally meaning Beyond the Sea, this rare pigment was more expensive than gold and exceptionally difficult to acquire. Mined exclusively in Afghanistan, it was highly valued and sought after by artists and their patrons in both the medieval and Islamic traditions. It was always reserved for only the most sacred subjects. Based on an archetypal six-fold grid, this pattern is seen throughout the Islamic world. The artist has used the traditional form in a contemporary context to explore the harmonies of green found in nature. 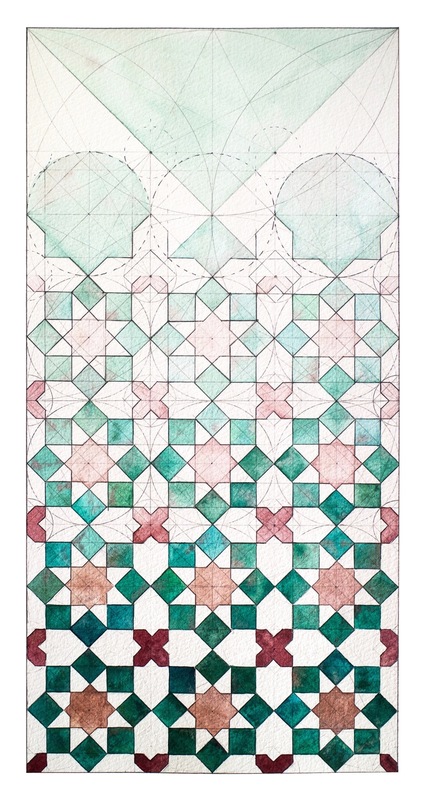 This illuminated watercolour is inspired by a painted ceiling from the Rustem Pasha mosque in Istanbul. The artist invites the viewer to reflect upon the gilded pathways and discover the hidden order within. 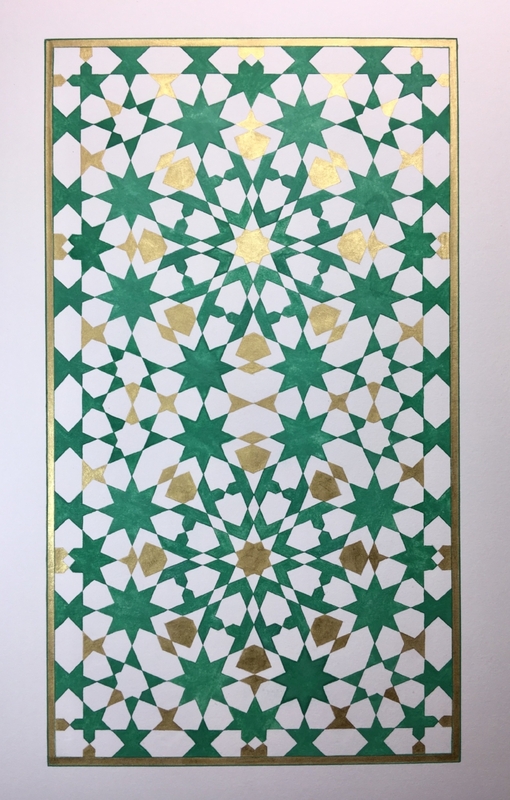 This piece is an interpretation of a classic Moorish pattern found in the Hall of the Two Sisters (Sala de Dos Hermanas) at the Alhambra Palace in Granada, Spain. piece that seeks constantly to draw the eye in a multitude of directions. ‘Tilismaat’ meaning magic or enchantment is a reflection on the transformative experience of creation. In this piece the artist has applied gold leaf and watercolour directly onto the underlying construction and in so doing, what was Manifest becomes obscured and the Unseen becomes visible as the pattern emerges. Juxtaposed next to its sister piece Tilismaat, Echoes draws on the same Moorish pattern from the medieval city of Fes, but highlights the negative spaces which are filled with light. verily in that are Signs for those who know. There is no order here. No map to take you home. In this series of three paintings, the artist shows three classic Islamic patterns which have been derived from the same archetypal grid. This foundation can be used to realise a multitude of designs, and serves as a clear reminder that no matter how diverse our appearance, or how far we think we have evolved, our origins remain the same. 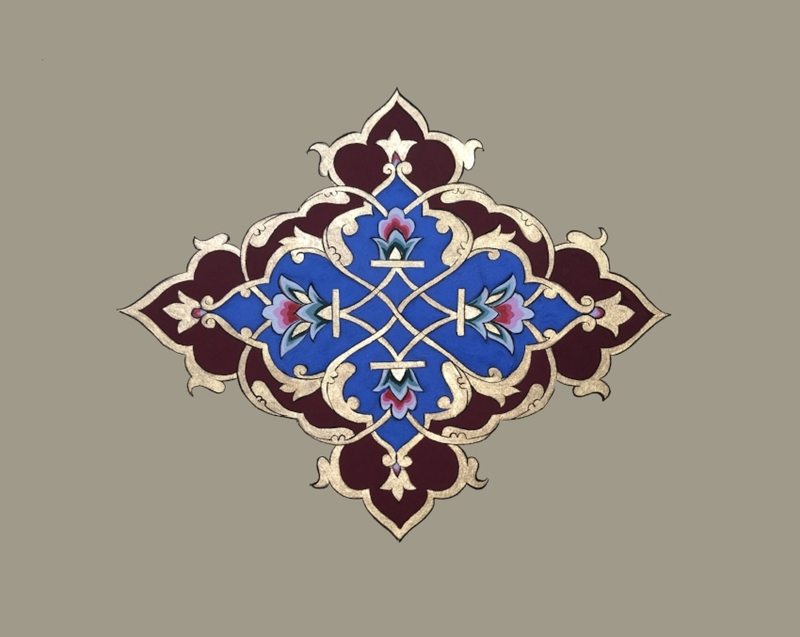 Explorations of Persian patterns, five fold symmetry and the golden ratio. The title of the piece ‘Nawa-e-Sarosh’ (the sound of angels) is borrowed from a verse by the celebrated Mughal era poet Mirza Ghalib (1797 - 1869). An exploration of Islimi forms and shading techniques.